Fusing two classic PANDORA elements - delicate hearts and encrusted stones - this signature Hearts of PANDORA ring is a true style statement. 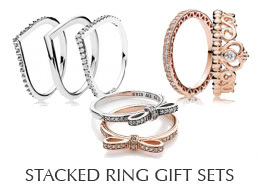 An essential part of any ring stack, the eternity ring can be combined with virtually any stackable PANDORA ring design. Hearts of PANDORA ring in sterling silver with cutout heart details and 46 bead-set clear cubic zirconias.